Partenophe once did from these very shores. 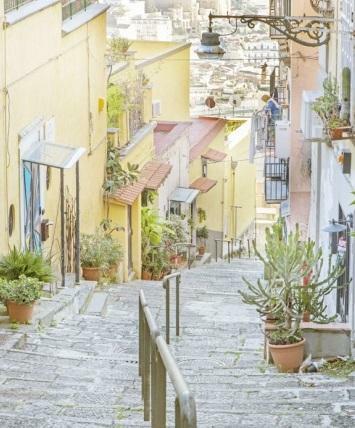 Situated in the heart of Europe and the Mediterranean, Naples is home to countless artistic treasures that any visitor to the city should endeavor to see. These treasures include the historic city center listed by UNESCO as a World Heritage Site; the palaces, churches, catacombs and underground tunnels and the city’s Archaeological Museum; the seats of power from medieval and Renaissance times clustered around Castel Nuovo and the Royal Palace; and the glorious seafront sweeping from Castel dell’Ovo up to Posillipo. Despite the difficulties and contradictions inherent to all great metropolises, deep down Naples remains a reality that is out of the ordinary. It is a reality that has to be lived, admired and tasted with each one of our senses: for its wealth of art and culture and its mild climate; for its theater and musical events, exhibitions, fairs and religious festivals; for its ‘foodie’ opportunities with the discovery of its centuries old gastronomic tradition. 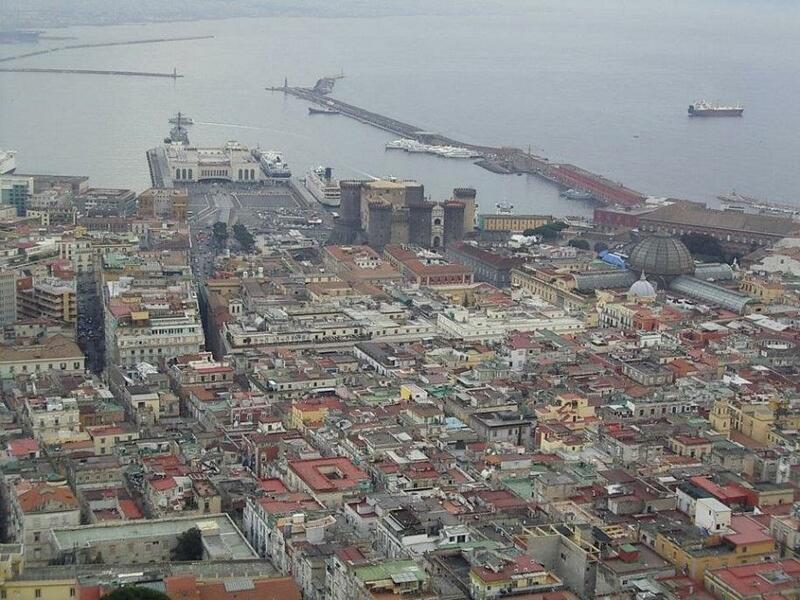 The old city, from Spaccanapoli to Piazza Mercato. 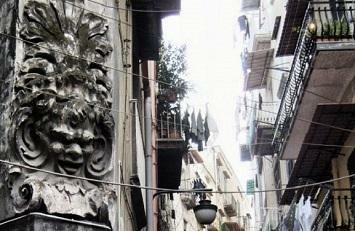 The “belly” of Naples is its Greco-Roman historic center where we can feel the very heart of the city beat. 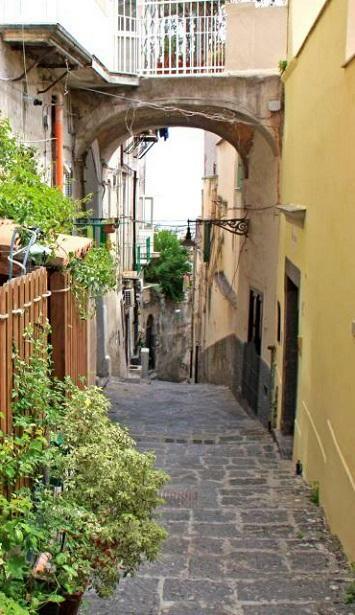 Main Street Via Benedetto Croce known as Spaccanapoli. The name is a popular usage and means, literally, "Naples splitter". Historically, the street is one of the three "decumani", or east-west streets, of the grid of the original Greco-Roman city of Neapolis. 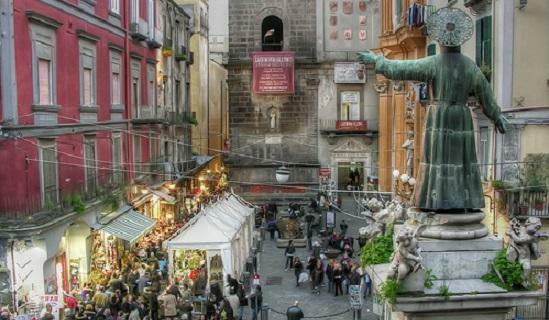 Today, the street officially starts at Piazza Gesù Nuovo, moving east, the street changes name to Via S. Biagio dei Librai and then crosses Via Duomo (named for the Cathedral of Naples) and moves beyond the confines of the old center of town. 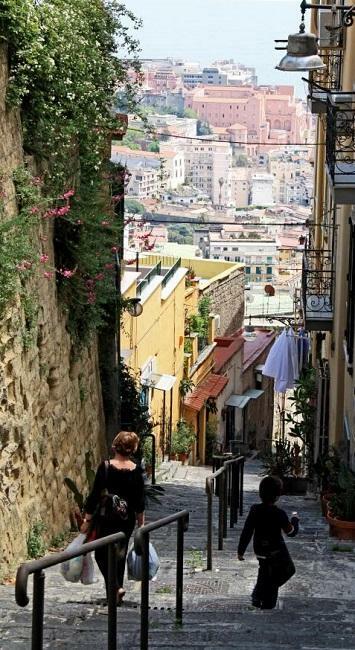 Spaccanapoli is the main promenade for tourists as it provides access to a number of important sights of the city. 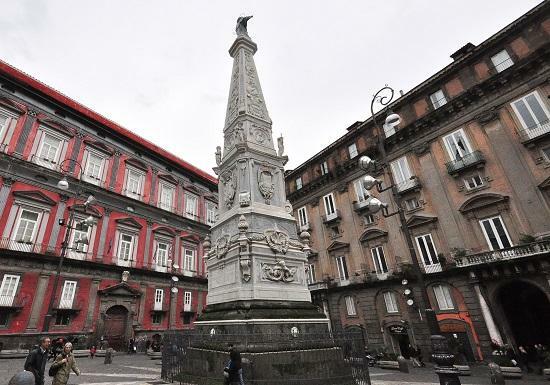 This is also the “cultural” centre of Naples, with the seat of the city’s primary university located in Via Mezzocannone, as well as the literary cafés in Piazza Bellini, the bookshops of Port’Alba, and the Italian Institute for Historical Studies in Via Benedetto Croce. Piazza del Gesù Nuovo is the gateway to the old city. The steeple of the Immacolata (1747) and the church of Gesù Nuovo introduce the visitor to the baroque spirituality of the city, whilst just a short distance away stands the austere church of Santa Chiara. Built in 1310 by Robert of Anjou, this church houses the 14th-century sepulchral monuments of the Anjou royal family. A wander through the famous Cloister of the Clarisses (Chiostro delle Clarisse) is a must with the visitor discovering a city that is suddenly cloaked in silence and sweetly scented by wisteria and narcissus. In Via Benedetto Croce stands the 13 thcentury Palazzo Filomarino della Rocca, once home to 20th-century philosopher and historian Benedetto Croce. 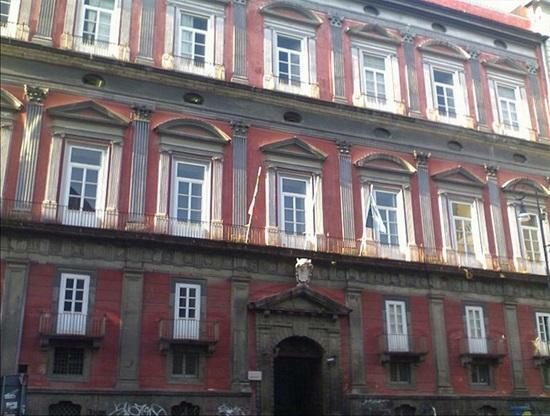 It was here that Croce founded the Italian Institute for Historical Studies, which remains a vibrant seat of learning to this day. Piazza San Domenico is one of the most famous urban legacies from the Aragonese rule, demonstrating the successful coexistence of different architectural styles that include the 13th-century church that was the ‘official’ church of the Aragonese dynasty. 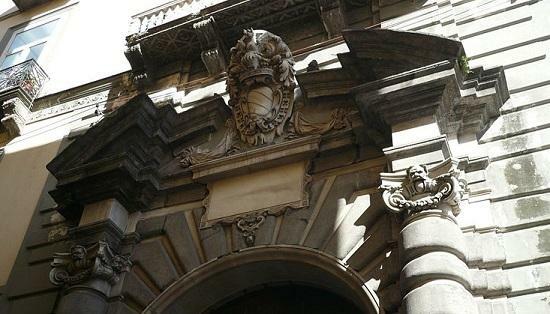 ...and finally Palazzo Sangro Sansevero. 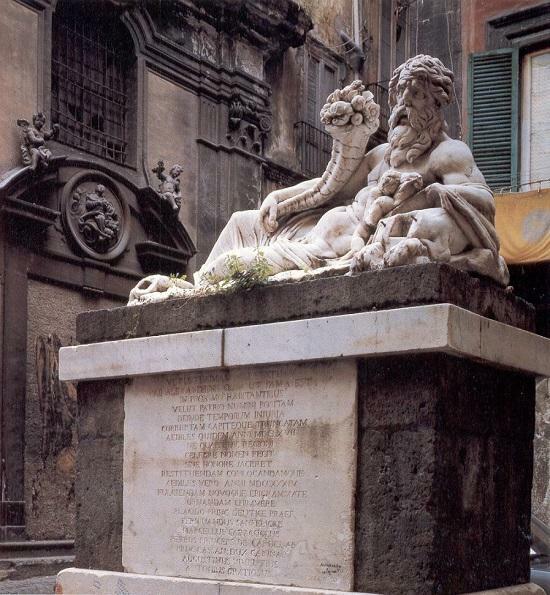 in Piazzetta Nilo, we find the Hellenistic statue of the river god Nile, unearthed in the Medieval period and known affectionately by the Neapolitans as the ‘Body of Naples’. 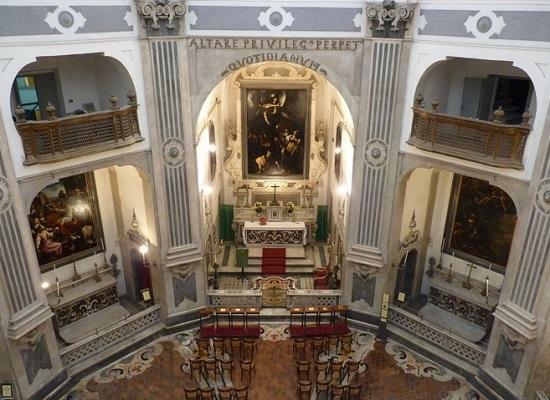 Here we can also visit the small 14 thcentury church of Sant’Angelo a Nilo, which houses the fine renaissance tomb of Cardinal Rinaldo Brancaccio. Strolling along Via San Biagio dei Librai , we can peer into a profusion of shops selling antiques, jewellery, and religious articles and vestments. 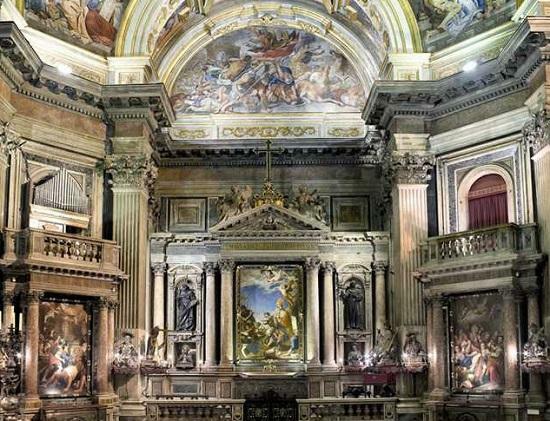 At number 14, we find a 17th-century masterpiece of late Mannerism: the chapel of Monte di Pietà, built into the monumental Palazzo Carafa. 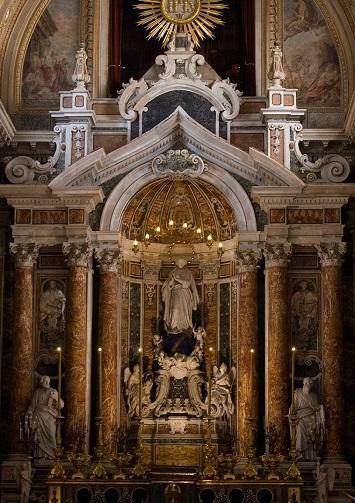 Almost hidden from sight down a side street called Vico San Domenico, we find the small yet extraordinary Sansevero Chapel, a spectacular baroque chapel that houses a true masterpiece: the sculpture of The Veiled Christ by Giuseppe Sanmartino. 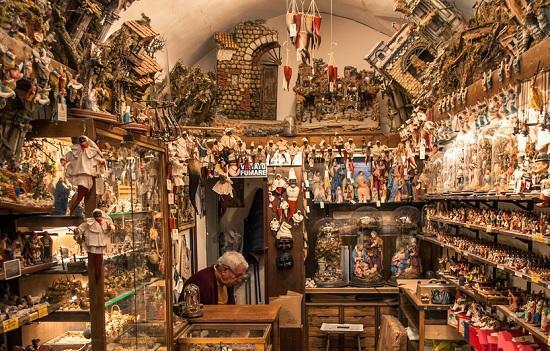 With its bustling crowds, Via San Gregorio Armeno is the center of the Neapolitan artisan scene. In the two months running up to Christmas, this street becomes the liveliest in the historic city center and is filled with stalls selling figurines and decorations for nativity scenes. 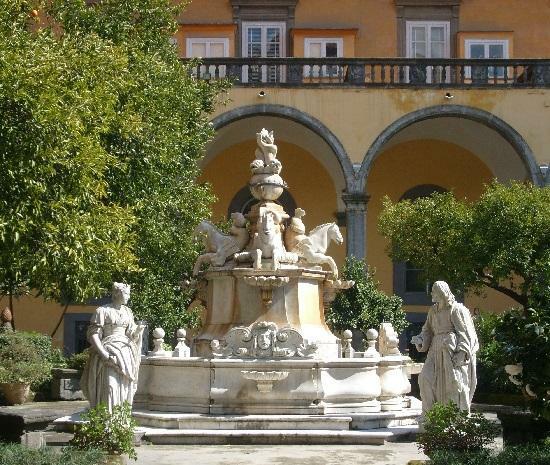 A visit to the cloister attached to the church of San Gregorio Armeno with its gardens, orchards and citrus groves is not to be missed. 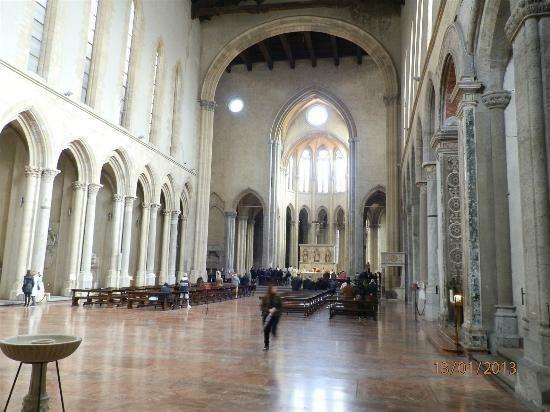 where Italian author and poet Giovanni Boccaccio first met his beloved Fiammetta on Easter Saturday in 1336. 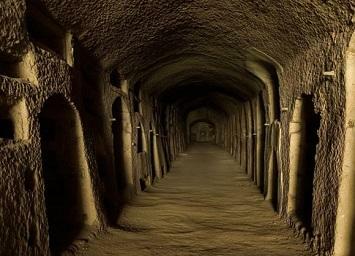 Gaetano and it is here that we can join a two-hour guided tour through the immense network of tunnels and chamber. The tour is an exciting and fascinating experience that reveals the secrets, history and the myths of the city. 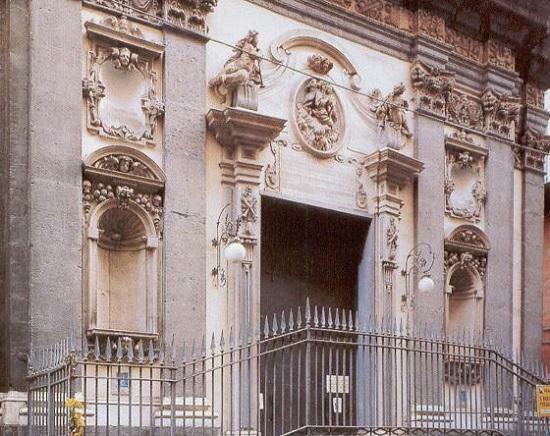 The small church of Santa Maria del Purgatorio ad Arco in Via Tribunali features bizarre baroque decorations that symbolize the devotion of the Neapolitan people to the "anime pezzentelle" (poor souls). 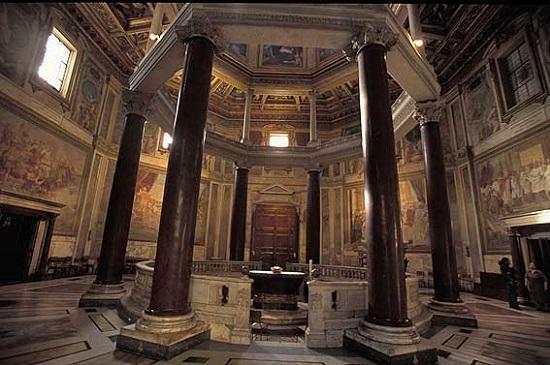 The Complex - which includes the Church, the Museum and the Hypogeum (the Lower Church) - represents an extraordinary opportunity to learn about the ancient cult of the souls in Purgatory. It was commissioned by noble families to bury their loved ones. 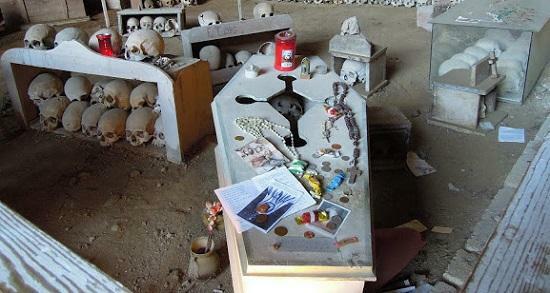 Here is buried Lucia, the Virgin Bride. According to legend, she was the only daughter of Domenico d’Amore, the prince of Ruffano. 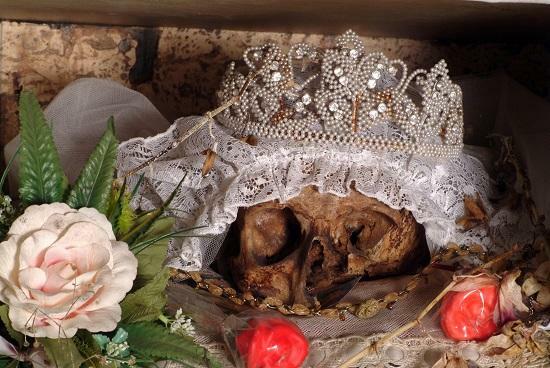 The young girl died when she was 17, shortly after she was wed to the Marquis Giacomo Santomango. The tragedy caused a tumult of heartfelt emotion by the populous who to this day leave fresh flowers and handwritten cards underneath her skull and bones. 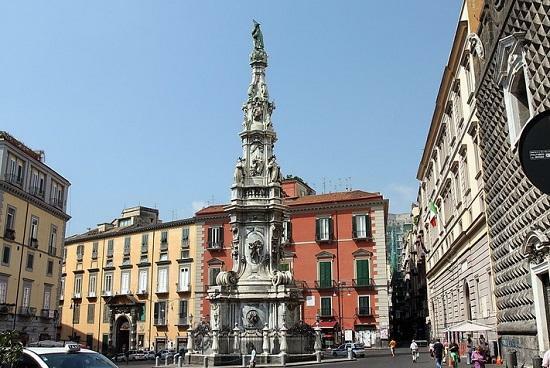 The nearby Piazza Bellini boasts a number of literary cafés and this buzzing square is at 14 its liveliest in the evening. A little further ahead, we find the church of San Pietro a Majella which has been home to one of the most famous musical conservatories in Italy since 1826. 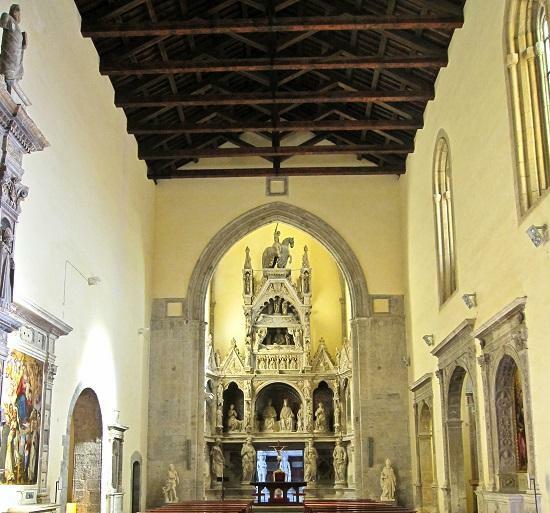 If we go in the opposite direction and head towards the last section of Via Tribunali, we find the church of the Girolamini, where it is possible to visit the Quadreria dei Girolamini (picture gallery) with its collection of works from the 16th through to the 18th century. 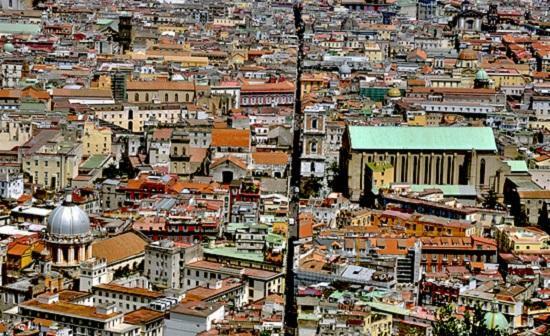 Via dei Tribunali intersects with Via Duomo, which takes its name from the city’s gothic cathedral. The cathedral was completed under Robert of Anjou in 1313, with the exception of the façade, which collapsed together with the bell tower during the earthquake of 1349 and which has been reconstructed a number of times. 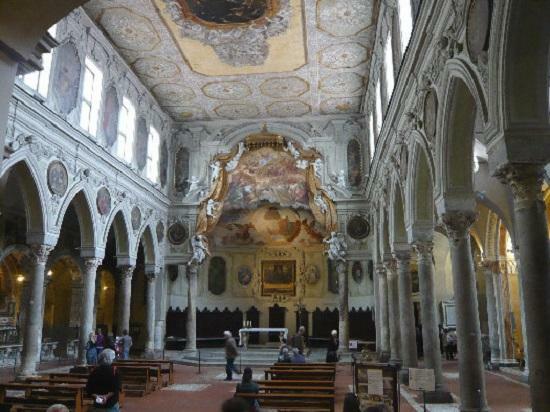 On the left side of the nave, we see the entrance to the early Christian basilica of Santa Restituta, founded in the 4th century by the Emperor Constantine, but which today has a spectacular baroque interior. 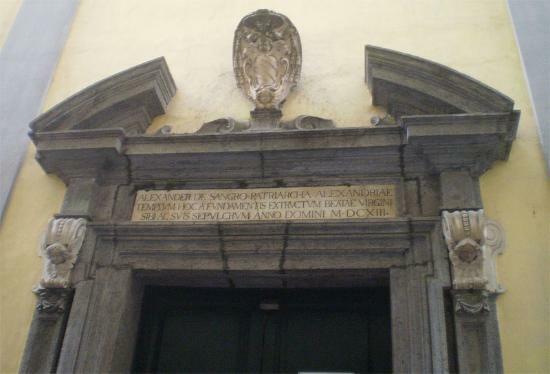 On the right side of the apse, we find the entrance to the baptistery of San Giovanni in Fonte. 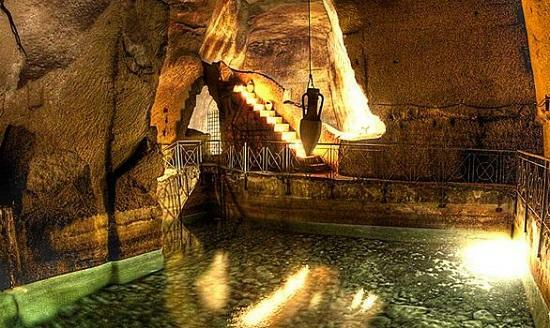 Built between the 4th and 5th century, it is the oldest building of its kind in the Christian West. 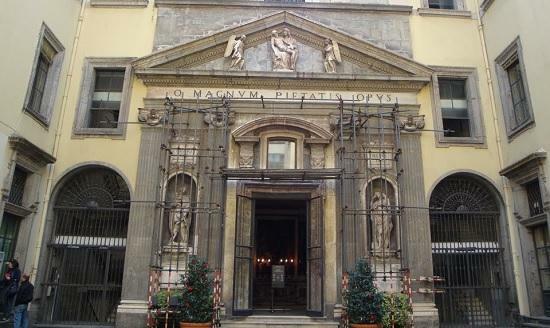 The chapel of the Tesoro di San Gennaro (the patron saint of Naples), which was built between 1609 and 1637, is a must see and it is here that a vial of the saint’s blood is displayed to the public for two weeks each year on the occasion of the miracle of its liquefaction. 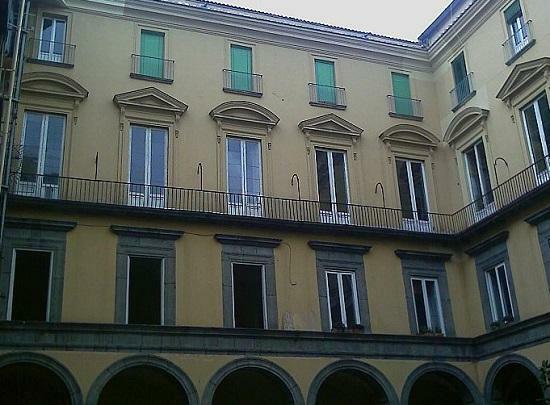 At number 288 Via Duomo, we find the Museo Civico Filangieri. 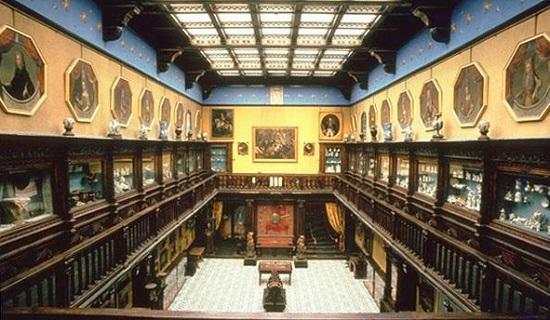 The museum’s collection is made up of a vast range of objects d’art, from weapons to porcelain, from paintings to costumes, and from books to furniture. In a side street beyond the cathedral on the right, we find the Palazzo Donnaregina, home to a large international museum of contemporary art. The museum, which is known by its acronym, Madre, was designed by the famous Portuguese architect Alvaro Siza. The permanent collection is made up of works by artists who have collaborated with the city in the past and includes Long, Bianchi, Clemente, Horn, Kapoor, Kounellis, Paolini, Sol Lewitt and Serra to name just a few. Once we have crossed Via Duomo, and we are once again on Via dei Tribunali, we will see the church of Pio Monte della Misericordia on the right. 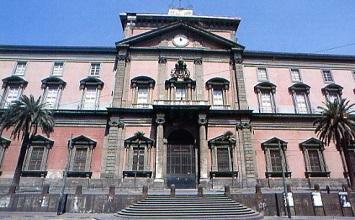 Founded in 1601, it is one of the city’s oldest charitable institutions. Above the octagonal church’s high altar hangs The Seven Acts of Mercy, one of Caravaggio’s masterpieces. 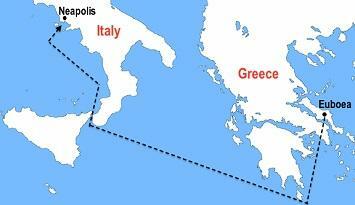 It was known by ancient Greeks as Νεάπολις and to the Romans as Neapolis , meaning 'New City ' in both languages. 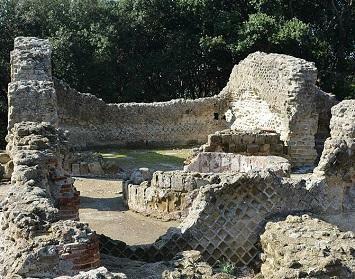 It became a linchpin of Magna Graecia, playing a key role in the merging of Greek culture into Roman society and eventually becoming a cultural center of the Roman Republic. 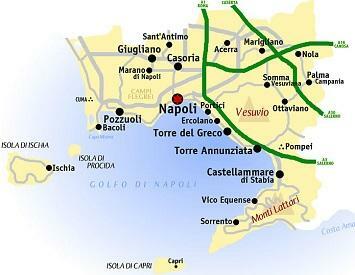 Partenope (in ancient greek Παρθενωπη) is the name of the first urban nucleus of the city of Naples, built on the hill of Pizzofalcone around the middle of the eighth century BC. 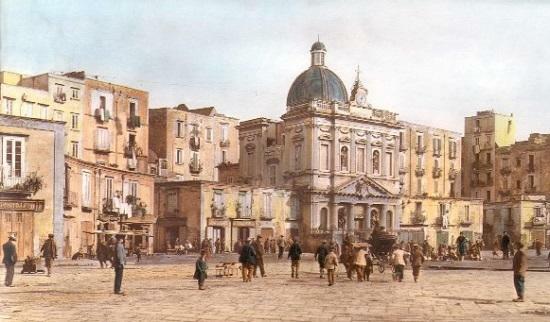 It was subsequently called Palepolis (old town), as opposed to the neighborhood of Neapolis (new town). According to the forefathers' philosophy of ancient Greece, water being the origin of life, Neapolis owes its beginning to the islet of Megaride (Megharis), where today you can admire the impressive Castel dell 'Ovo. 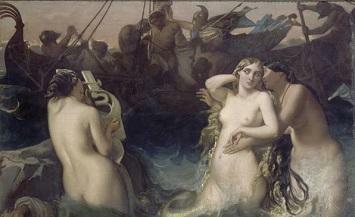 The myth is that of the seductive siren Partenophe who failing to seduce the handsome Ulysses committed suicide drowning in the sea​ near the islet. Her body legend says, was buried on Megaride. 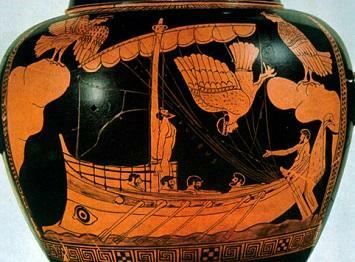 (The sirens where Greek mythological creatures with the head of a woman and the body of a bird and later half woman and half fish). 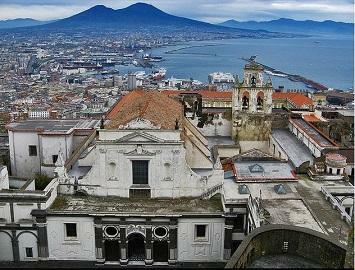 The Bourbons arrived in 1734 and governed the Kingdom of Naples until 1860 when Italy was unified. 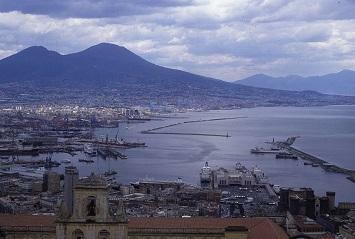 Naples, capital of the south for more than 600 years, remains, quite naturally, the heart of this formidable area for whomsoever desires to travel with eyes and mind open in search of new stimulus. 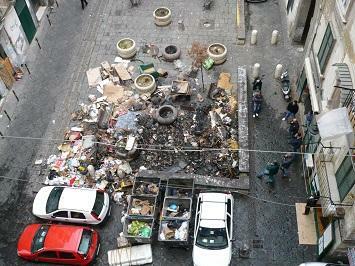 Modern Napoli is is the capital of the province of Campania and the 9th-most populous urban area in the European Union. 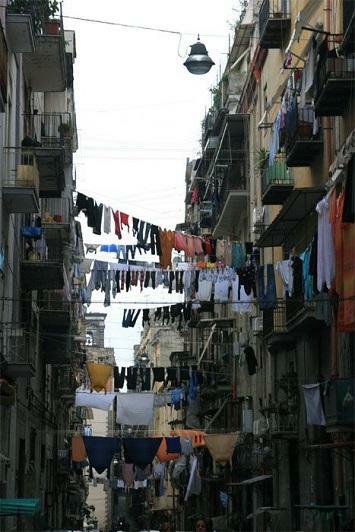 Around 4 million people live in the Naples metropolitan area, one of the largest metropolises on the Mediterranean Sea. Getting there , around & about. 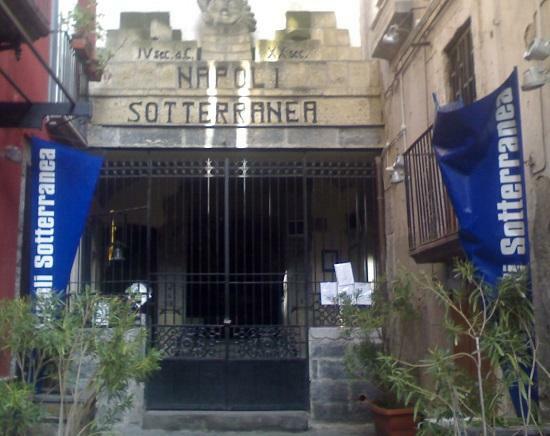 Aereoporto Internazionale di Napoli (Capodichino) - Naples' international airport is 7km or 10 minutes from Stazione Centrale rail station, 20 minutes from ferry and hydrofoil ports. The Alibus arrives and departs from the bus stop that is located approximately 50 meters form the entrance to the airport . Central Train Station - Most national trains arrive at or depart from here with frequent connection to Ercolano, Pompei and Sorrento. The Alibus stop is located in Piazza Garibaldi midway between the Central Station and Corso Garibaldi. 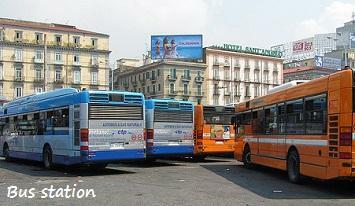 at the city bus parking lot in front of Hotel Cavour. ALIBUS from the Stazione Centrale to the Aeroporto di Capodichino. 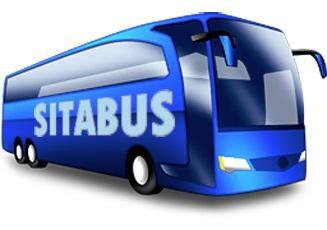 Regional bus services are operated by Sita. Some of the destinations include Amalfi, Pompei, Positano. ...learn more . 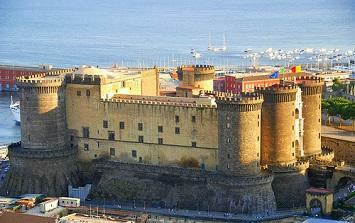 By Boat - From Molo Beverello, in front of Castel Novo you can catch the boat to many popular destinations. (Approximately 15 to 17 Euros). 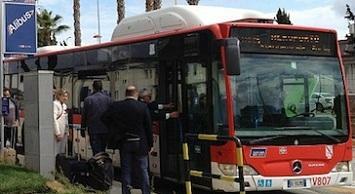 Gescab SNAV - Ischia - Procida - Capri - Sicily - Sardinia - Marocco - Spain - Tunisi. 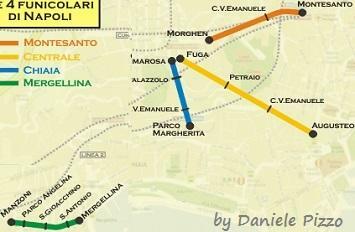 Funicular - There are four lines connecting the lower city with the higher districts of Vomero, Chiaia and Posillipo. Funicular Central , Piazza Augusteo, from Via Toledo to Piazza Fuga, also known as the"shoppping funicular" because it connects the shopping areas. Funicular di Chiaia, connecting the residential area from Via del Parco Marcherita to Via Domenico Cimarosa. Funicular di Montesanto, connecting the popular district of Pignasecca (a must see) with the upper Vomero , from Piazza Montesanto to Via Raffaele Morghen. 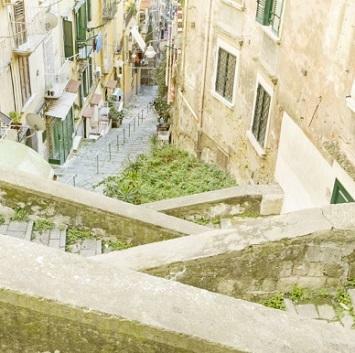 Funicular di Margellina, Via Manzoni, connecting the hill of Posillipo with the city center, maybe the most panoramic of them all. Metropolitana - The customer help line is operational with an automated informational menu 24 hours a day, with operators available from Monday to Sunday from 7:30 until 19:30. 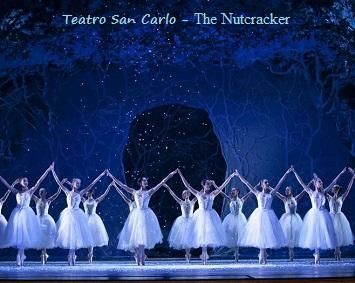 Tickets are available from UNICO Napoli Tickets. 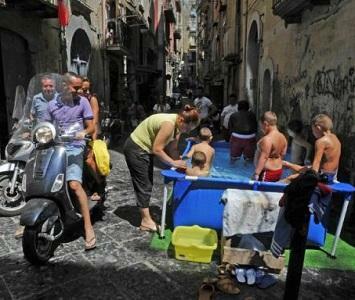 Car and motorcycles - Driving in Naples is insane, this is the city where a red light is an incitement to speed up. The anarchic traffic makes driving a very bad option. 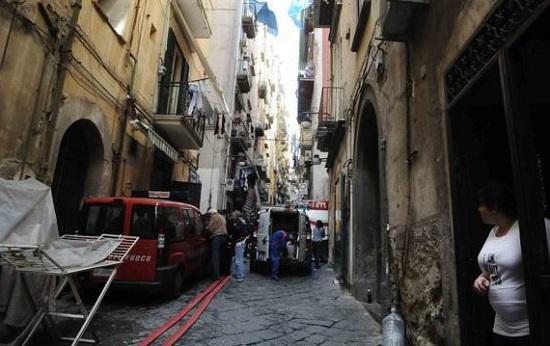 Officially , much of the city center is closed to non resident for most of the day. 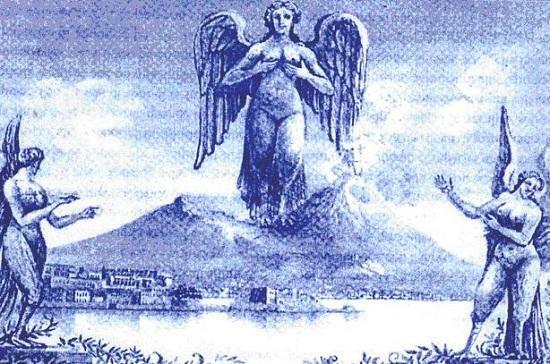 the Campania Art Card, which covers admission and transport (from € 15 to € 30 more or less ). Also valid for Pompei and Paestum. 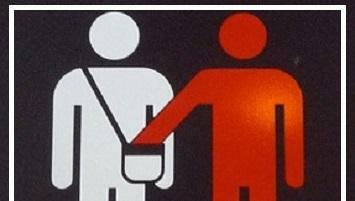 Note : There is usually a separate entry booth for the travel card holders . Look on the glass window of the booth. There are many versions of the Campania Artecard, many of which don't include free transportation. Be also very aware of the specific version which you're purchasing, and whether it fits your needs and itinerary. Learn more. Beware (very) of pickpockets - They usually work in tandem - using young cute children to distract the intended victim is one of the many methods used. 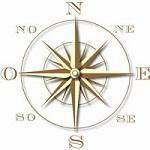 Tour Guides - Verify (don't be shy to ask) that they are indeed who they say they are . 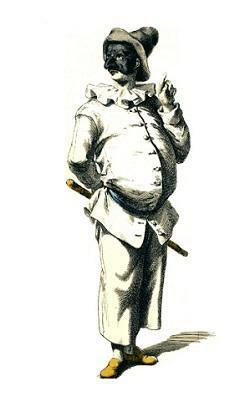 Pulcinella, is a classical character that originated in the commedia dell'arte of the 17th century and became a stock character in Neapolitan puppetry. According to Pierre-Louis Duchartre, his traditional temperament is to be mean, vicious, and crafty and his main mode of defense is to pretend to be too stupid to know what's going on. In various European languages, including at least Italian, French and Spanish, a "Pulcinella's secret" is an "open secret." 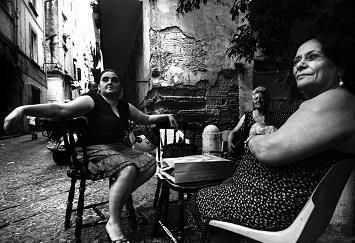 Contrary to what some international tour organizers imply, Napoli is NOT a misunderstood city, it is what it is, hate it...or love it. 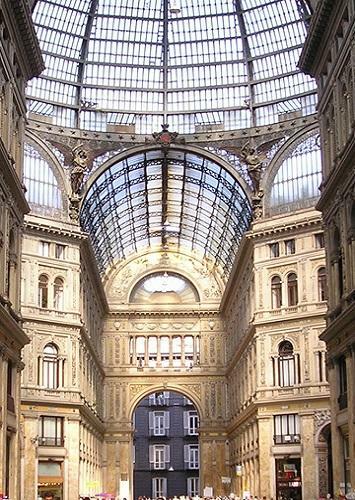 To enjoy Naples you must come here with an open mind. 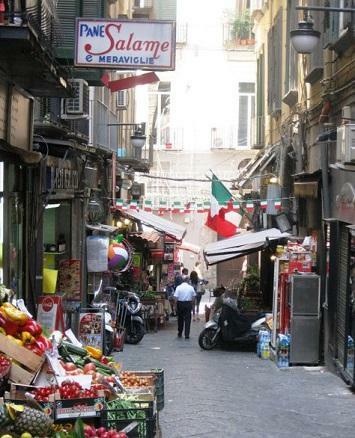 It is not as pretty as you have seen in the pictures, it is old, scruffy, filthy, chaotic, noisy...so, lets face it, you go to Napoli to reconnect, to be teased and even seduced, you go to Napoli to live the real Italian experience , one you will never forget. Places you should consider . 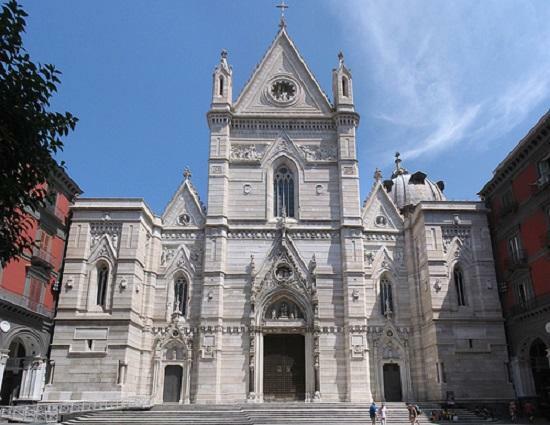 ​The Duomo with the Chapel of San Gennaro (The treasury's chapel) contains the celebrated blood of San Gennaro, or Janarius, and the battistry. 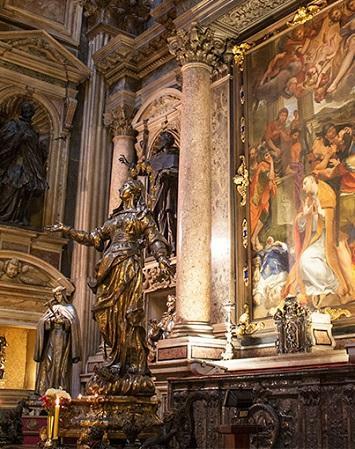 The magnificent chapel is highlighted by the precious decorations and large silver reliquary busts. The Cathedral, (il Duomo) has a beautiful door and columns of African and Egyptian granite that once graced the Temple of Apollo. 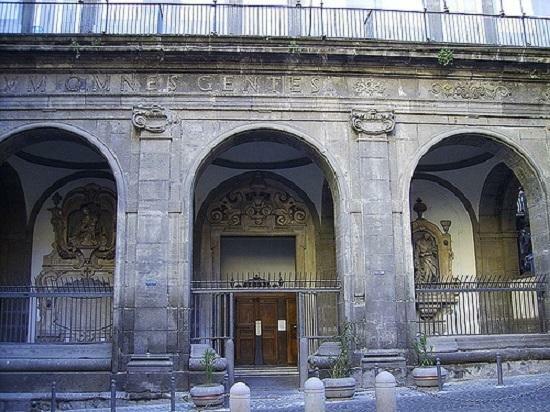 Near to piazza Dante is the National Archeological Museum, (Museo Archeologico Nazionale) the most important museum of classical archeology in the world. 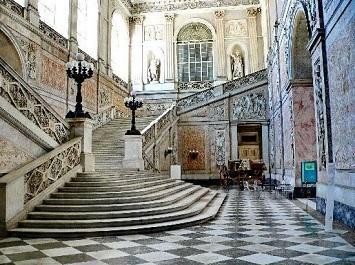 Charles of Bourbon put the largest art collection in Italy, the Farnese collection inherited by his mother Elisabeth, into this building (the old “Study Palace” or university). 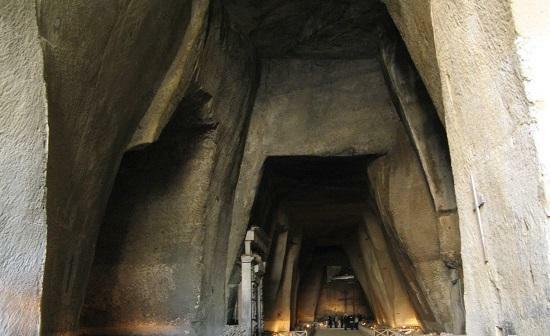 Over the years the largest archeological collection of all time, relics from the city and from the villas buried under the ashes of Vesuvius in 79 BC, was brought here. 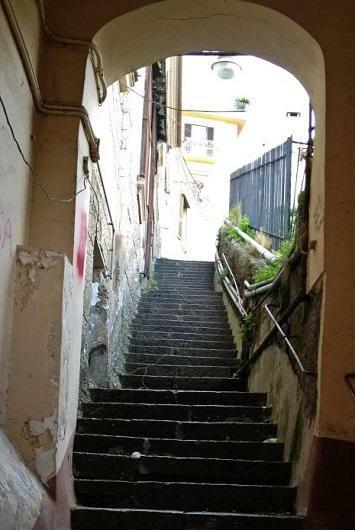 Take the Vomero funicular or the Pedamentina stairs . 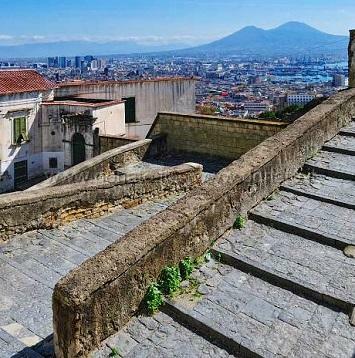 Along with Castel Sant'Elmo that stands beside it, this is the most visible landmark of the city, perched atop the Vomero hill that commands the gulf. 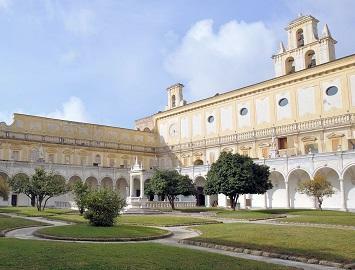 In the early 19th century, under French rule the monastery was closed and was abandoned by the religious order. 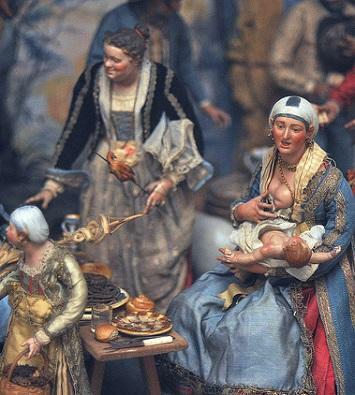 Today, the buildings house a museum with a display of Spanish and Bourbon era artifacts, as well as displays of the presepe—Nativity scene—considered to be among the finest in the world. 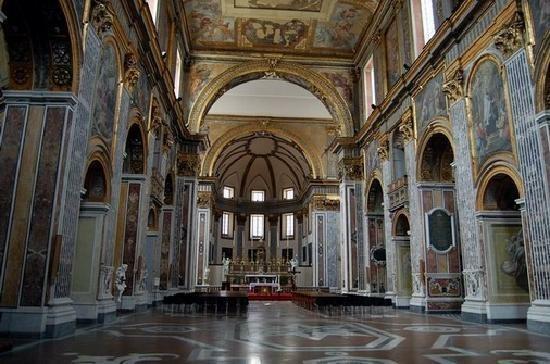 Basilica di Santa Chiara - An oasis of calm in the heart of Naples. A stroll in the cloister of the Poor Clares is not to be missed. It can only be fully appreciated from inside. 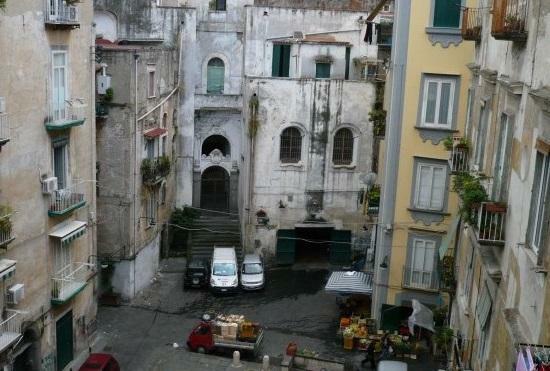 Here in the large courtyard the busy city of Naples seems many miles away. 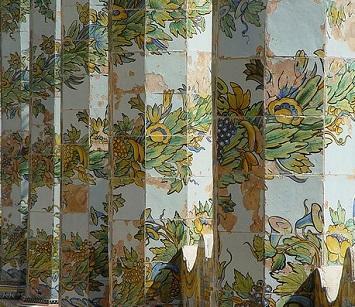 Here, the air is perfumed by narcissus and wisteria; yellow, green and blue are the dominating colors of the tiles that dress the magnificent octagonal columns and the seats on which the neapolitan “riggiolari” Donato and Giuseppe Massa painted pastoral and mythological scenes. 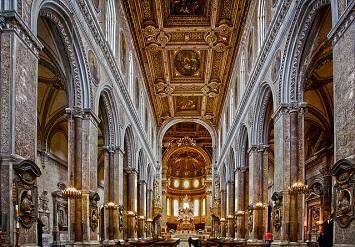 The Cappella Sansevero - Here Naples suddenly becomes silent. 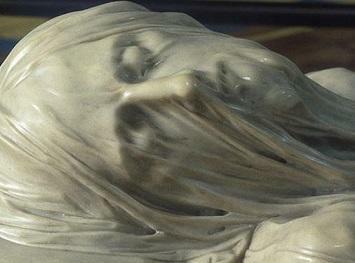 Here you will find the triumph of a single artwork, the Veiled Christ. 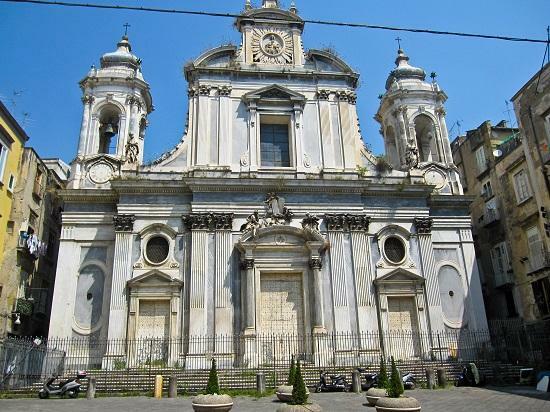 The church of Gesù Nuovo or Trinità Maggiore is one of the most important basilica churches of Naples, and it stands in square by the same name. The church was so named to distinguish it from the old church of Jesus. 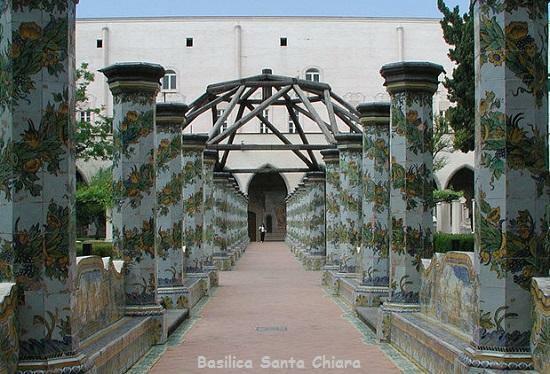 Santa Lucia and Chiaia - ​Castel Nuovo, a landmark with fragments of Giotto's frescoes. 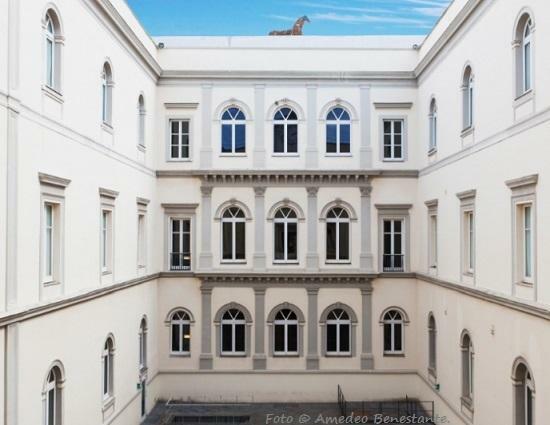 It also houses the Museo Civico. 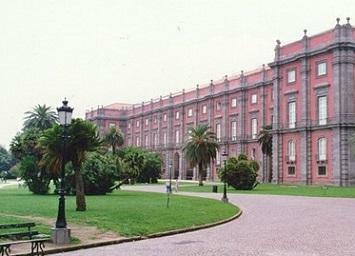 Capodimonte Palazzo Reale (see the palace, Museum and Park). It was intended to be a hunting lodge for the king Charles VII of Bourbon in 1738. It houses an extensive art collection . 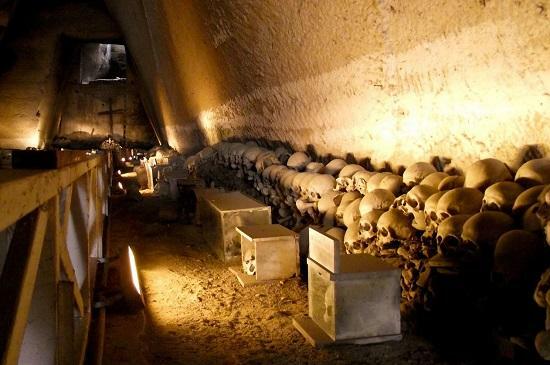 Catacombe di San Gennaro - It is the oldest and most famous of Naples catacombs dating back to the second century. 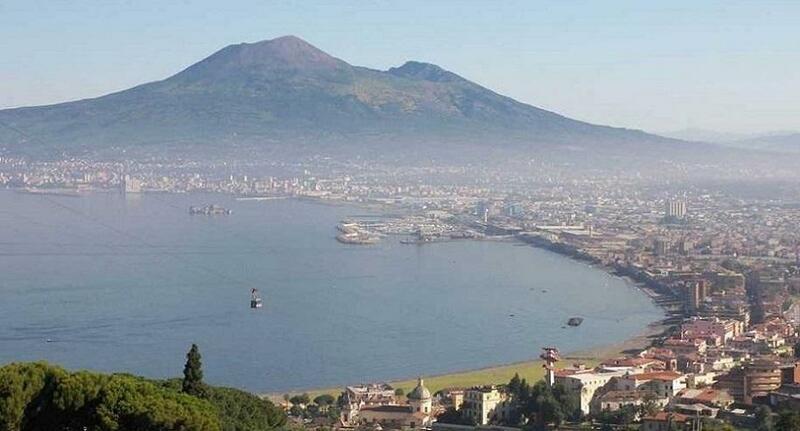 They are situated in the northern part of the city, on the slope leading up to Capodimonte. The site is now easily identified by the large church of Madre del Buon Consiglio. Contattateci tramite il modulo in fondo alla pagina. 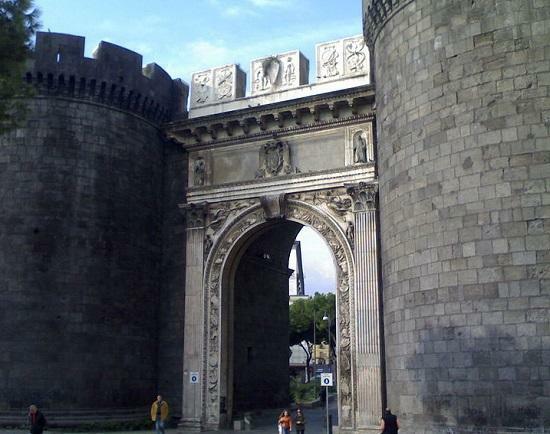 Here we also find one of Naples’ many gates, Porta Capuana. Built in 1484, this was the most important gate the western side of the city. 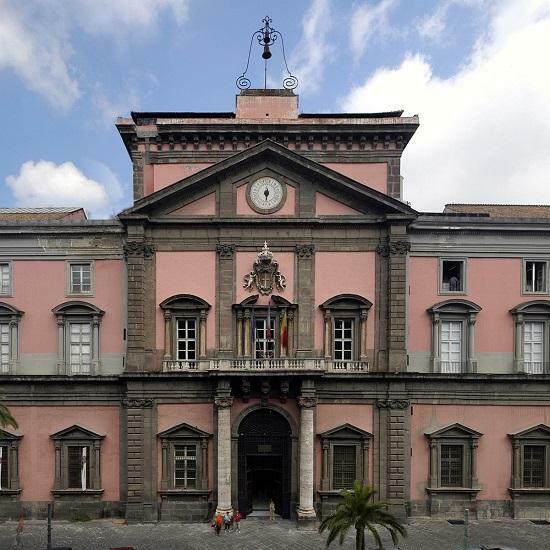 Near to piazza Dante is the National Archeological Museum, the most important museum of classical archeology in the world, with relics from the city and from the villas buried under the ashes of Vesuvius in 79 BC. 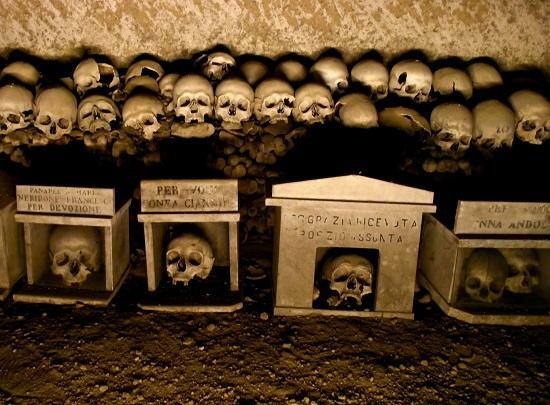 The Fontanelle Cemetery (Cemetery of the little fountains, in Neapolitan ‘O campusanto d’ ‘e Funtanelle) is an ancient cemetery of Naples, located in Fontanelle St., in the Sanità neighbourhood, one of the oldest districts of the city. The area was rich with water springs , hence the name . 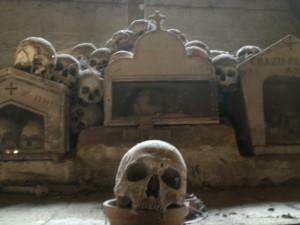 The cemetery hosts the remains of 40,000 people, victims of two big pestilences in 1656 and 1836. Brief history - Sometime in the late 17th century—according to Andrea De Jorio,a scholar from the 19th century, great floods washed the remains out and into the streets, presenting a grisly spectacle. 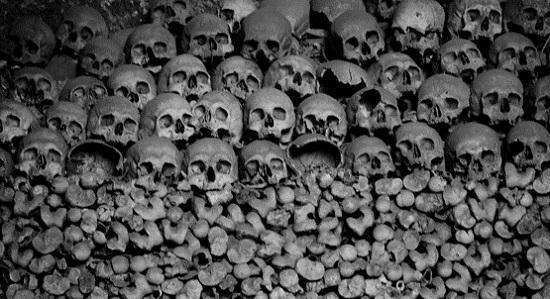 The anonymous remains were returned to the cave, at which point the cave became the unofficial final resting place for the indigent of the city in the succeeding years—a vast paupers' cemetery. The last great "deposit" of the indigent dead seems to have been in the wake of the cholera epidemic of 1837. Defenders of the cult pointed out that they were paying respect to those who had had none in life, who had been too poor even to have a proper burial. 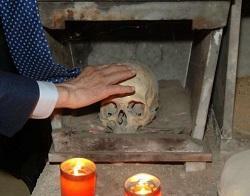 Devotees paid visits to the skulls, cleaned them—"adopted" them, in a way, even giving the skulls back their "living" names (revealed to their caretakers in dreams). 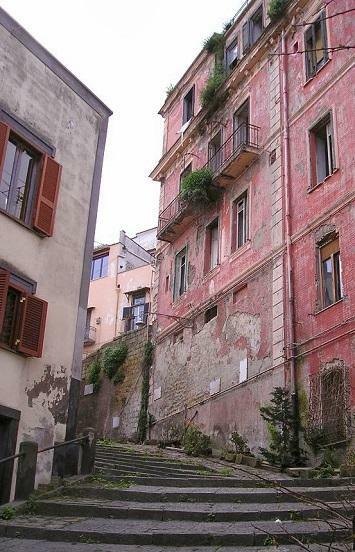 Quartieri Spagnoli (Spanish Quarters) consists of an area including a population of some 14,000 inhabitants. 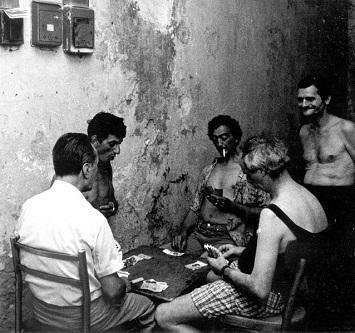 The housing in the Quartieri Spagnoli is usually a six floors block with a roof terrace and a central courtyard. 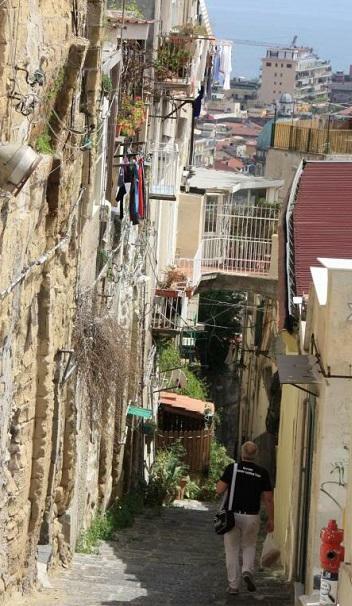 The width of the average street is about 3 meters. 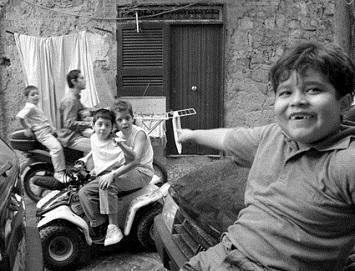 It is a poor area, suffering from high unemployment, where the Neapolitan language is stronger than anywhere else and where the Camorra has a strong influence. 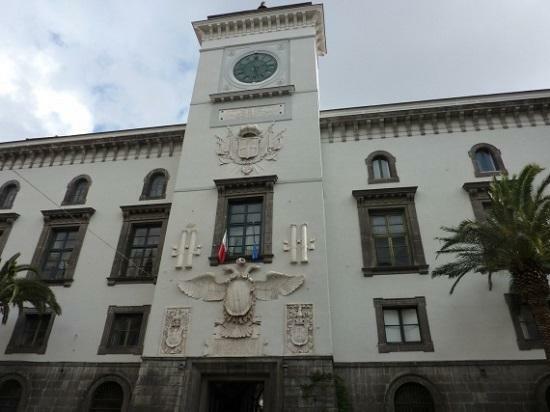 The Quartieri' were created in the 16th to house Spanish garrisons, hence the name, whose role was to quench revolts from the Neapolitan population. Soon they became an infamous quarter with a high rate of criminality and prostitution. 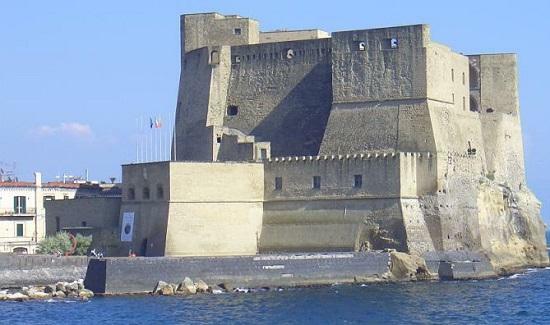 Castel dell'Ovo (in Italian, Egg Castle) - The seaside castle is the oldest standing fortification in Naples, located on the former island of Megaride where Greek colonists from Cumae founded the original nucleus of the city in the 6th century BC. 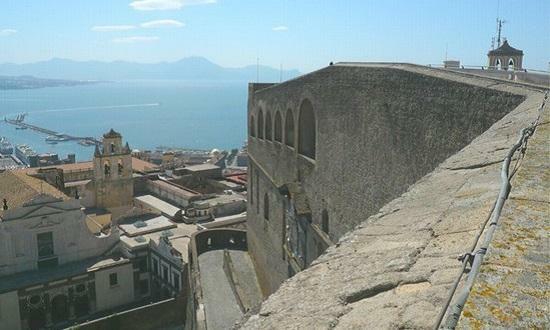 Castel Sant'Elmo - It's a bit of a hike to get to from the town centre, but the view from the battlements is stunning, or take the funicular central line to Fuga station and follow the signs to st Elmo Castle. The entrance fee is 5 Euros each adult price, and the only thing worth going for is the view from the top, which is spectacular. There is a small art museum at the top. 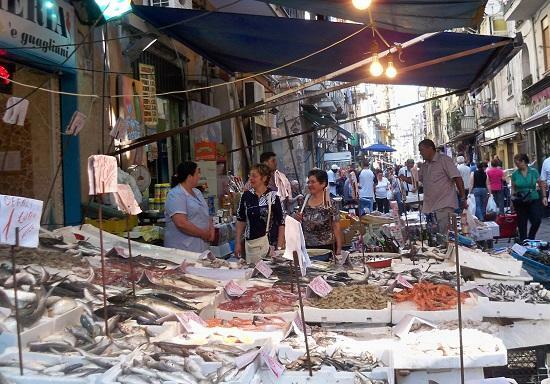 Two of the city’s most picturesque markets, specializing in fish, fruit and vegetables, can be found here and near Porta Nolana, close to the railway station in Piazza Garibaldi. The castle is located on the waterfront, not much to see except the spectacular views ...and is free to get in, not a place to be after dark. 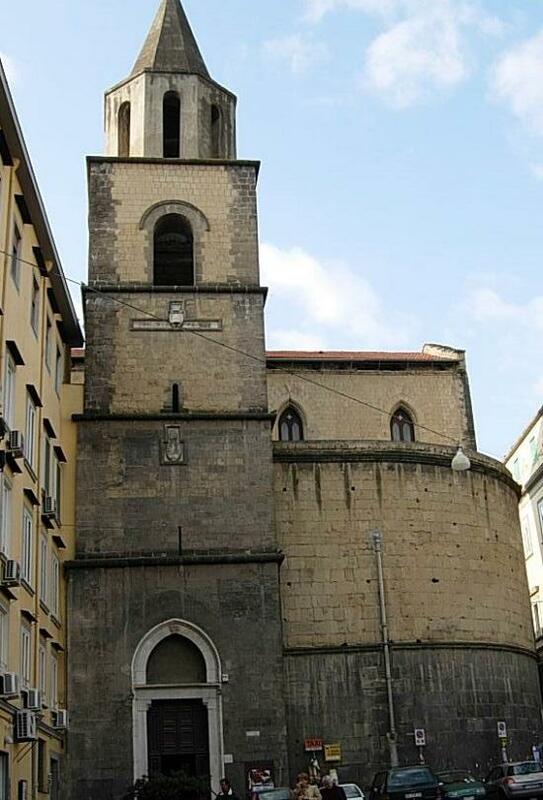 Not far away, we find the church of San Giovanni a Carbonara, built between 1343 and 1418. 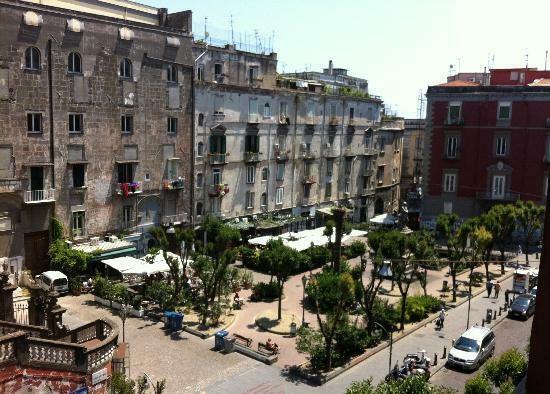 Our final stop is Piazza Mercato, one of the key spots in Neapolitan history. This is where Conradin of Swabia was beheaded in 1268 and where Masaniello rallied the people during the anti-Spanish revolt that he led in 1647. 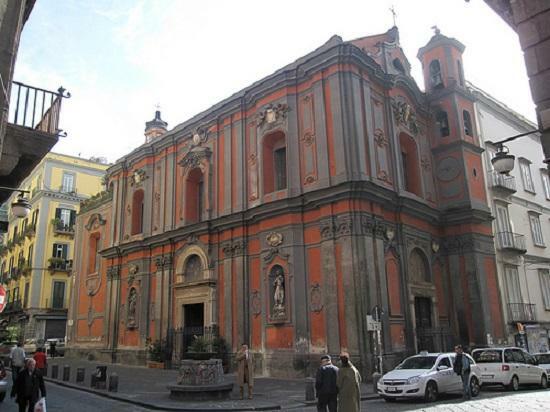 The square is dominated by one of the most popular and venerated churches in Naples, the Basilica of Santa Maria del Carmine, dedicated to Santa Maria la Bruna. And finally, in Via Nuova Marina, we arrive at the port. Begun by Charles II with the building of the Molo Angioino (Angevin Pier), the port was extended over the centuries until the first half of the 20th century when it reached its present day dimensions. Visible is Castel Nuovo and La Galleria. 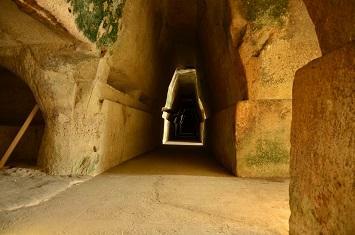 Cuma Caves - Cumae is perhaps most famous as the seat of the Cumaean Sibyl. Her sanctuary is now open to the public. Cumae was the first Greek colony on the mainland of Italy and the seat of the Cumaean Sibyl. 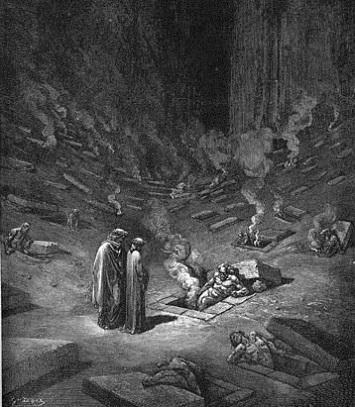 In Roman mythology, there is an entrance to the underworld located at Avernus, a crater lake near Cumae, and was the route Aeneas used to descend to the Underworld. The ruins of the city lie near the modern village of Cuma, a frazione of the nearby comune of Bacoli. offering a unique breathtaking scenery. 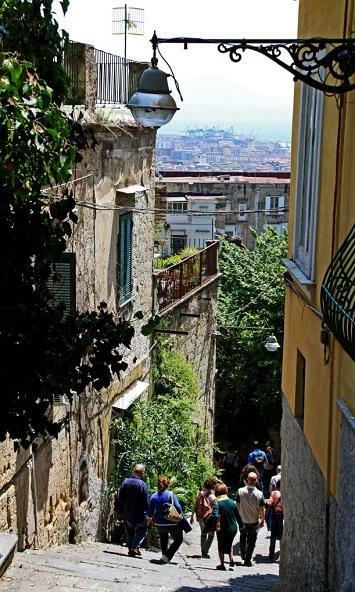 The steps of Naples are ancient footpaths that connect the center with the hills and the coast. Once abandoned , they are now being rediscovered, adding to the enjoyment of urban trekkers and inquisitive tourists. 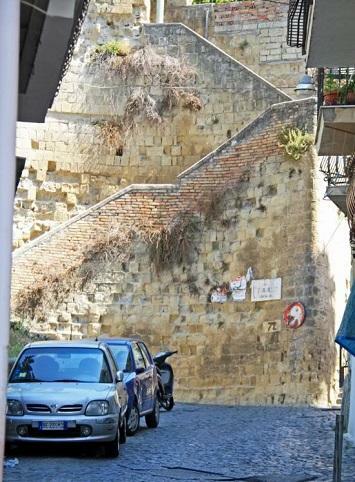 These roads were built also to easily connect various monumental buildings, especially religious monasteries, retreats, churches, and are considered masterpieces of urban planning. 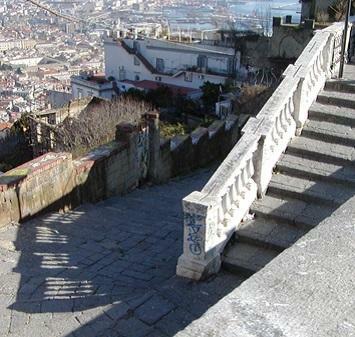 There are more then two hundred stairs spread through the city, from the sea to the hill. One of the longest and the most panoramic is the Pedamentina San Martino, connecting the high district of the Vomero and the San Martino Monastery complex. The first expansions effecting neighboring hills, took place in the sixteenth century by orders of the viceroy Don Pedro Álvarez de Toledo to create an area exclusively for the Spanish garrisons (now corresponding to the zone of Montecalvario) expanding the city toward the hills of the Vomero and at the same time connect the upper and lower city by a network of junctions characterized by gradinate (steps) and ramps. CONTATTI tramite il modulo soprastante. Contattateci tramite il modulo soprastante. che potrebbe essere un punto di visibilita' anche nei vari mercati internazionali.